GRAMMYS: The ‘Lifetime Achievement Award’ Goes To? The 61st Grammy Awards is set to air February 10, 2019, to reflect the best works of the Recording Academy. 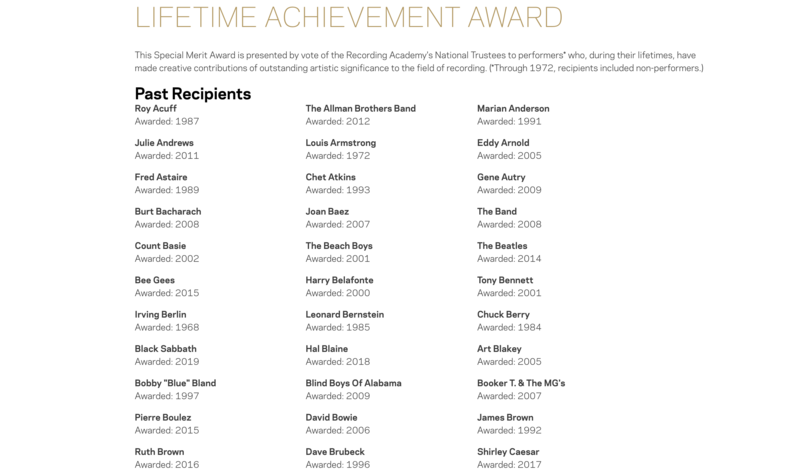 The ‘Lifetime Achievement Award’ is given to musicians who have “made outstanding contributions of artistic significance to the field of recording” over the decades. So who will get it? This year honorees include BLACK SABBATH, Billy Eckstine and Donny Hathaway. Also receiving the Lifetime Achievement Award are George Clinton & PARLIAMENT-FUNKADELIC, Julio Iglesias, Sam & Dave, and Dionne Warwick. Here is a list of some of the few musicians who have been honored in the past! Earlier this month, the full nominations for the 61st Grammys were announced. So head to the Grammy website to see a complete list of categories and nominations for the upcoming 61st Annual Grammy Awards. Previous ArticleWhat You Need to Know About Netflix 2019? Next ArticleIN or OUT: What You Should Be Wearing in 2019 and What You Need to Get Rid Of!